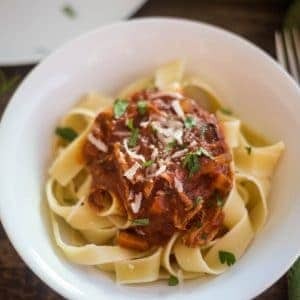 Instant Pot Pork Ragu is one of the easiest and tastiest recipes! I love to make this meat sauce. This delicious pasta sauce ragu can be made in the Instant Pot, Slow Cooker, Oven, and even Stovetop! This is a fix and forget recipe, so you know I love it! A perfect make ahead meal! Great for family dinners and always an easy meal to make for family and friends! After celebrating both Pumpkin Week and Apple Week and today I hit the east end of Long Island to get some fresh fall veggies from my favorite farm stand, I came to the conclusion fall is in full swing! 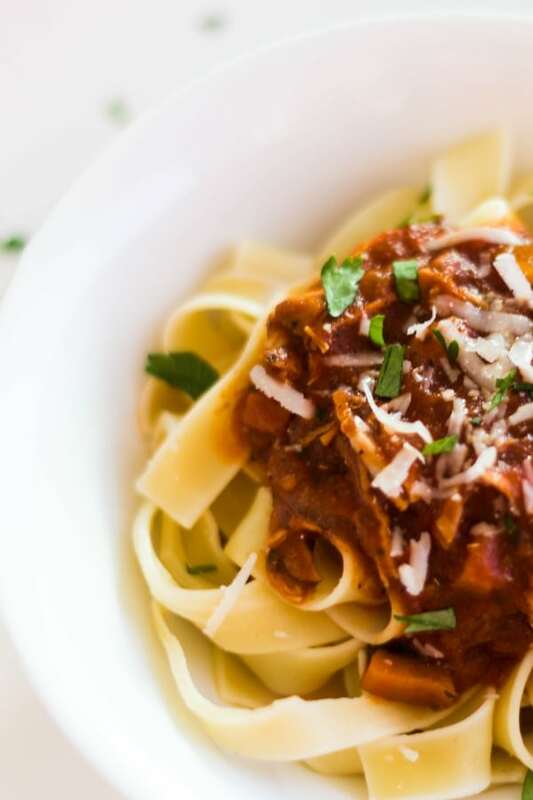 It is a no-brainer, I must share this hearty Pork Ragu Recipe! Easy, delicious and I promise, this ragu is straight up comfort food! Another family favorite recipe and I hope it becomes a favorite for your family. Pork Ragu, an amazing meat sauce! I started making this pork ragu a few years ago. We were visiting friends on Fire Island and it was a potluck type of day! One of the guests whipped up a similar pork ragu that as generations old in his family and he shared his recipe with me! The hubs and I loved it! I know, we had it in the middle of the summer! That is another reason I love this recipe so much! We eat this pork ragu year round! It is just so darn good! Besides tasting amazing, I love that this pasta sauce can be made in just about any cooking vessel! I can’t pick a favorite because the pork tastes amazing cooked in them all! Plus, I am getting feedback from you all, which I love, that you like to have the options of different cooking vessels! So I am going to give them to you! 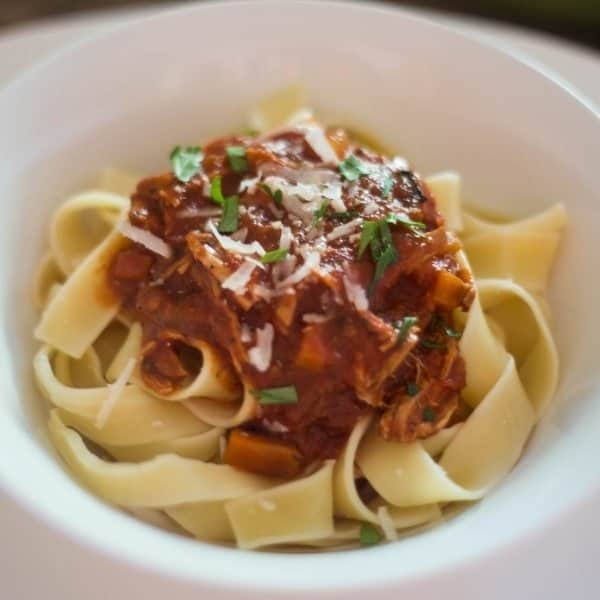 I will say this pork ragu in the Instant Pot is so easy. Very convenient for busy nights too! Ragu is Italian cuisine. Usually using pork or beef with veggies and tomatoes. A great sauce for pasta. How do you serve pork ragu? I love serving Pork Ragu with Pappardelle, Bucatini or other thicker pasta, mashed potatoes, zoodles, or mashed cauliflower. Can you freeze pork ragu? Yes! This is one of those perfect freezer meals. I use my new favorite meal prep tool, the food saver, to freeze everything these days! The pork ragu stays well for 4 months when frozen correctly. What type of pork is best for pork ragu? I use boneless pork country ribs. Feel free to use bone-in country ribs or a shoulder pork roast to make pork ragu. 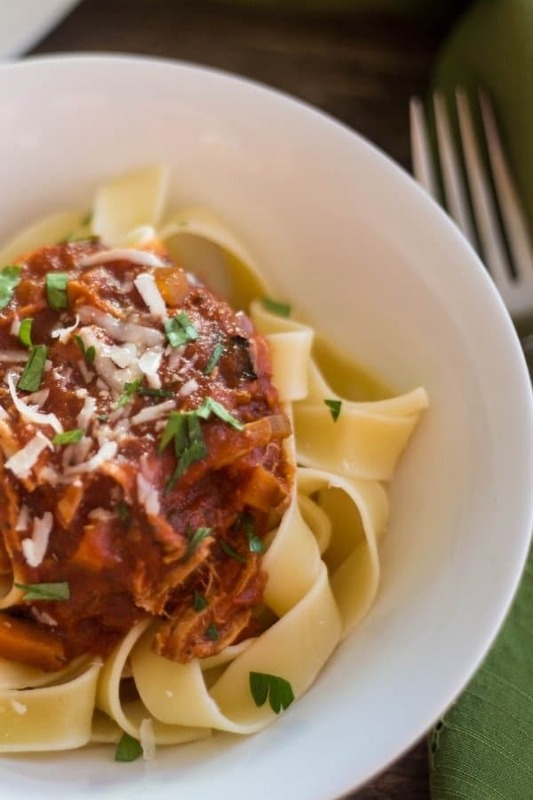 Want to make the pork ragu ahead of time and freeze? Freeze the ragu. Remove the sauce from the freezer the evening before. Keep in the fridge to defrost. Reheat the pork ragu on the stovetop, stirring frequently. Prepare the pasta according to manufacturer directions. I love this when guests come over! The pork ragu has little prep when made ahead. Cooking Meat Shredding Claws: These cooking claws I found a while back. The best find ever to use to shred beef, pork, chicken, etc. Don’t forget to shop the Everyday Eileen store on Amazon! Season pork with black pepper and garlic powder. In a large saute pan, over medium heat, add olive oil. Add the pork and brown on all sides. Set aside. Add in the onions, carrots, and celery. Saute for 2 minutes. Add in garlic. Stir one minute. Stir in the red wine and use a wooden spoon to pick up and stuck brown bits at bottom of the pan. Cook about 2 minutes. To the slow cooker the red wine reduction, crushed tomatoes, tomato paste, water, bay leaf, fennel, oregano, basil, black pepper, and a dash of salt. Stir together. Add in the browned pork. Place lid on slow cooker. Set for 8 hours low, 4 hours high. Pork should pull apart easily. Remove and shred the pork, return to sauce. Discard bay leaf. Check the seasoning, reseason if needed. 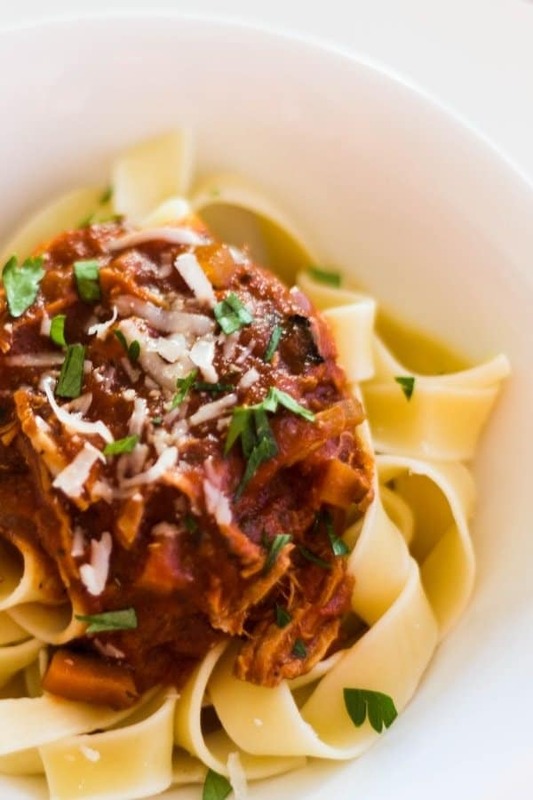 Serve pork ragu with pappardelle or your favorite pasta, mashed potatoes, etc. 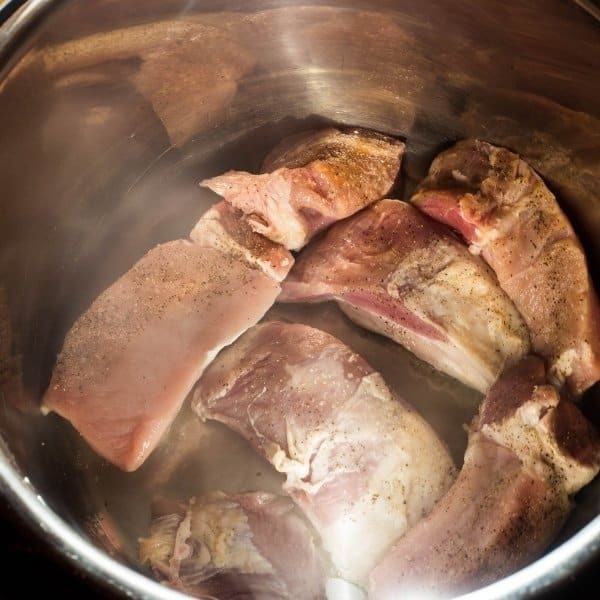 Follow the instructions under “How to Make Slow Cooker Pork Ragu” steps 1 – 4, use a dutch oven or large pot. Continue with step 5, continue using your dutch oven or large pot to add the remaining ingredients. Add in the browned pork. Cover with the pot cover or lid. Braise in oven for about 2 1/2 to 3 hours. Serve with any of the yummy choices in step 11 of the slow cooker instructions. Follow steps 1-4 of the slow cooker instructions, use a dutch oven or large pot. Reduce heat to low. The pork and ragu sauce will slowly simmer. Let simmer about 2 -2 1/2 hours. Stir every 20 minutes. Turn Instant Pot to “Saute”, 15 minutes. In the base of the Instant Pot add the olive oil and sear the pork pieces, set aside. Stir in the onions, carrots, and celery. Saute for 2 minutes. Stir in garlic. Add in red wine. Use a wooden spoon to pick up and stuck brown bits at bottom of the pan. Cook about 2 minutes. 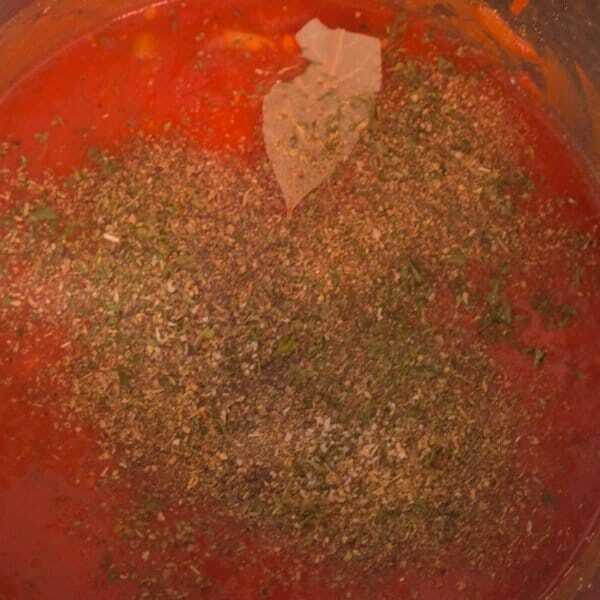 To the Instant Pot, add the crushed tomatoes, tomato paste, water, bay leaf, fennel, oregano, basil, black pepper, and a dash of salt. Stir together. Add back in the browned pork. Shut off the Instant Pot. Place lid on the Instant Pot. Turn the valve to the closed position. Set manual pressure to 40 minutes. High pressure. Let pressure release naturally for 5 minutes. Turn the knob to release. Remove lid. Remove pork and shred with for or cooking claw. Discard bay leaf. Return to pot and check the seasoning, reseason if necessary. We love when you make and share my recipes! by tagging me, @everyday_eileen on Instagram! 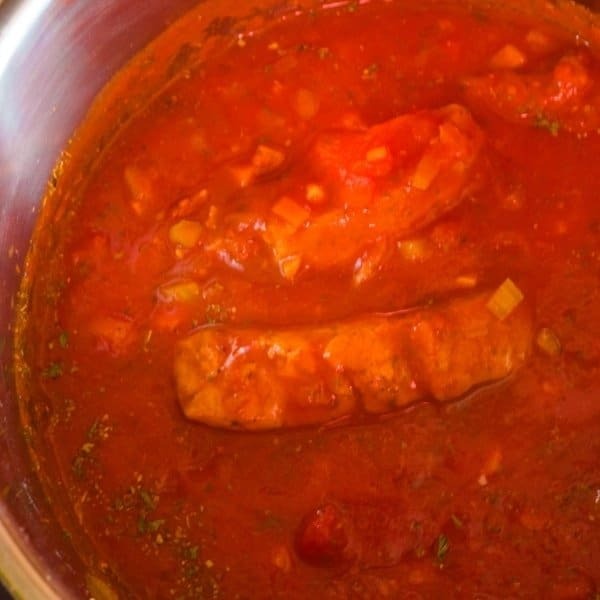 Love my Pork Ragu Recipe, Leaving me a 5-star rating and any comments below always are very helpful for me and for anyone looking to make this recipe! I really appreciate all your comments and ratings! Pork Ragu is a hearty sauce that is a great sauce on pasta, mashed potatoes, zoodles, or mashed cauliflower. Instructions included for Instant Pot, Slow Cooker, Oven, Stovetop. A great make ahead freezer. Great for a family dinner or when guests are coming for dinner. Season country pork ribs with garlic powder, onion powder, and black pepper. Set aside. Turn the Instant Pot to Saute, 15 minutes. Add 1 Tablespoon olive oil. Add in the seasoned pork and sear until brown on all sides. Set aside pork. If needed, add the second Tablespoon of olive oil to the Instant Pot. 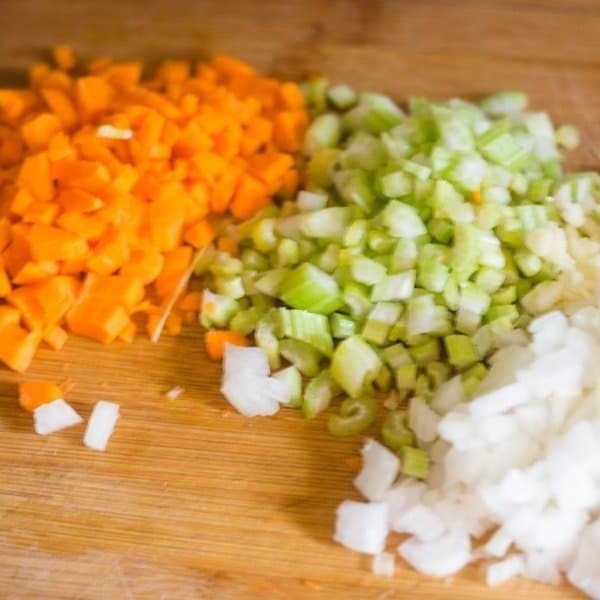 Add in the carrots, celery, and onions. Saute till veggies get soft, around 3 minutes. Add in the minced garlic, stir for a minute. Add in the red wine, use a wooden spoon to bring up any brown bits at the bottom of the pot. (Note 2). Let saute about 3 minutes. Stir in crushed tomatoes, diced tomatoes, tomato paste, water, bay leaf, oregano, basil, and fennel. Add in a dash of salt and pepper. Cancel saute on the instant pot. Add in the brown pork pieces. Place lid on Instant Pot, lock it and close the vent. Press "Pressure Cook" high pressure and put the time to 40 minutes. Once cooking complete, naturally release the pressure for about 5 minutes. Then turn valve to auto release remaining steam. Once complete, remove the lid, discard the bay leaf. Shred the pork, check seasoning, reseason if needed. Serve with pappardelle or your favorite pasta. If a low-carb alternative is needed, see note 4. Note 1: I use boneless country ribs. Country ribs on the bone can be used as well as boneless shoulder roast. Note 2: Make sure you bring up all the brown bits at the bottom of the pot. Besides adding flavor this also prevents the "burn" message on the Instant Pot. Note 3: Although fresh Parmesan Reggiano is optional, please don't leave it out, so delicious on top of the pork ragu! Mangia! Note 4: Pork ragu recipe is really amazing with pappardelle pasta. To keep your meal low-carb, feel free to have this over zoodles, cauliflower rice, cauliflower mash, or spaghetti squash. I just had this for dinner using bone-in country ribs and it was delicious. I printed out the Instant Pot version and was following it to the letter. That is until I got to step #6 to put the lid on and seal it. The browned ribs were still sitting on a plate from the end of step #2. I stopped what I was doing and came back to this page. That was when I noticed a few other differences. The print version says to pressure cook for 40 minutes and naturally release. The longer instructions say to cook for 45 minutes and do a 5-minute natural release, followed by venting. Does it matter which way you do it? Also, are you supposed to drain the crushed and diced tomatoes before adding them to the pot? I did but reserved the liquid in case the sauce was too thick. It was OK as is. Lastly, step #6 says to “Pressure Cool”. Hey Chuck, I am so glad you enjoyed the recipe! This is a favorite of mine too!I have made this recipe so many times. I update recipes often and I fixed the instructions. I do prefer the 40 minute pressure cooking, 5 minutes natural, then an auto release. Either will work with delicious results. I use the entire can of crushed tomatoes. The diced tomatoes, I do drain and only use the tomatoes. Fixed that on the recipe. I hope you enjoy the recipe again! Thank you for taking the time to let me know clarification was needed on the recipe. I am so appreciative of feedback! Again glad you enjoyed the ragu! It looks like it is time to buy myself a slow cooker. This recipe is amazing. Thanks! I am glad you like the recipe Andy! Enjoy! So many great tips for this recipe. I appreciate all the cooking vessel options as well as the simple to follow directions. I also love that you gave suggestions of other ways to serve this. I would never have thought to put ragu on top of mashed potatoes, but I”m super excited to try it now! I am glad you like the recipe and the flexability of cooking vessels, enjoy! There is nothing better than a good Italian meat sauce. I may be a bit prejudiced being Italian and all. But the recipe looks fantastic! Ragu seems to improve with flavor as it ages and it freezes beautifully. We always have some kind of meat sauce in the freezer. Great recipe. Ah, Marisa, you are the Queen of Italian cooking! I am humbled and thankful you like the recipe! What a great recipe. You make it look so doable. Thanks for this, I have never tried to make ragu before and you make it look easy. Definitely going to have to try this one. Tina, this is an easy and a family favorite! I hope you try it and enjoy! Wow I’m so glad I stumbled upon this. I’ve been gathering a list of easy make ahead freezer meals for when I go back to work after maternity leave. I love all the instructions on different ways to cook too. Oh and I have a food saver too and just adore it. Thank you! This is great news Tracy! Congratulations on the new baby and enjoy the ragu! Bring it on!! I so want to try this. I mean, I really want to try it on Fire Island, but I’ll have to settle for my kitchen in St. Louis. You broke it down so well that I know I can do it! I am in love with every ingredient in this dish! The word “ragu” can be intimidating, but the way you’ve broken it down, it’s so simple and inviting. I also love that’s it’s made up of everyday ingredients. There’s no fancy footwork going on with this recipe, yet promises ALL the comfort. Great job and thanks for sharing this one with us! Thank you so much Traci! I hope everyone enjoys it. It is simple and tasty! It’s been a long time since I’ve had a good pork ragu, but there is a pork shoulder in the freezer right now that would be perfect in this dish . Thank you for sharing the various cooking methods — I am probably the only person on the planet who doesn’t have an instnat pot, but this would work well on the stove top in my dutch oven. Over some egg noodles, this would make a “clean-plate-dinner-club” meal every time. Thank you for the inspiration! Ah, that is excellent Lisa! Enjoy the ragu! Well you certainly have ALL the bases covered to cook this recipe. We do love pork, and pasta…so this works for me. What a great recipe to double up on. Love having stuff in the freezer for “insane” days!! Thank you Gloria! I hope the recipe covers instructions for everyone to enjoy! I am in LOVE with this recipe! The fact that you provide instructions for cooking it in any number of vessels is so convenient. 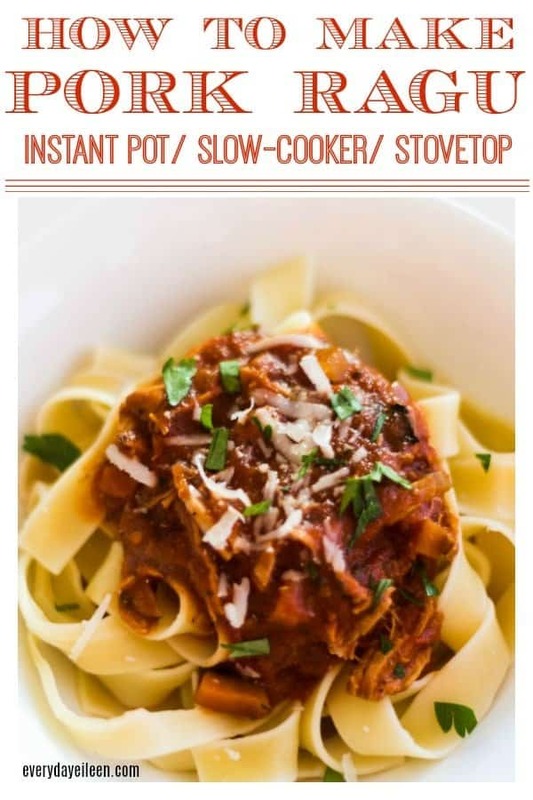 Especially in those nights where I forget to start dinner earlier and need to rely on my Instant Pot for something last minute but still super tasty. You made my day Kristen! I hope you add this pork ragu into your families meal rotation. This looks amazing! I’m always up for a big bowl of comfort food like this Pork Ragu and I love how you’ve broken it up in several ways how to make it. 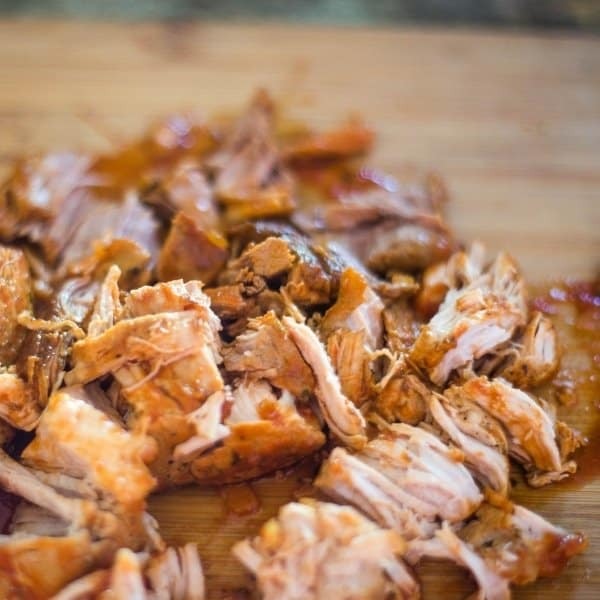 Thanks for linking up your recipe to the Celebrate 365 National Pork Month Blog Party! It was my pleasure to link up to your Celebrate national Pork Month Party! You are so sweet and thank you for your very kind comments!